Although it is possible to make leather from virtually any animal skin, only a few are suited for the production of shoe uppers. Shoes made of alligator skin are unique in quality, pricing and looks. The alligator is viewed as the crocodile’s weaker cousin because of their striking resemblance in appearance and behavior. Historically speaking, alligators were hunted ruthlessly for ages for their hide which is a valuable raw material to make all kinds of items like shoes, belts, wallets, handbags etc. 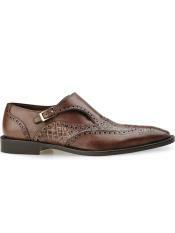 Men alligator shoes made of alligator skin is one of the best ways to show luxury. Right from a very long time, these alligator shoes are seen as a sigh of lavishness and class. Though many men loved to wear alligator shoes, it was nearly impossible for many to get these exotic beauties as a treat to their feet. Men’s alligator shoes were a rarity as processing and styling this type of leather was hard in those days. Today’s modern equipments and other easier procedures are capable enough to mass produce these men alligator shoes with perfect finish and style. The skin of the alligator is considered to be extraordinary. The alligators are endowed with tough skins and the same quality is also applicable for alligator shoes. 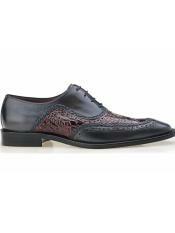 This exotic alligator skin shoes is known for its durability. There is undeniably lot of hype about alligator skin and so alligator skin shoes are used by people who consider themselves as a class apart. Wearing alligator shoes is considered as a status symbol. As the hide of the alligator is tough and durable it can withstand any weather conditions. This is to confirm that if you buy a high quality pair of alligator shoes, you are making an almost life investment. The imaginative craftsmanship that you find in alligator shoes cannot be matched by any other. Alligator shoes are available for all occasions and they also come in variety of colors, designs and styles. The way the alligator skin is crafted gives the shoes a new look and it looks sleek. This shoes made of alligator skin are mostly handcrafted and their interiors invariably possess soft leather that allows for maximum comfort. The durability of the original alligator skin is one of the reasons for being accepted by the wearers. As they age they look more sophisticated- provided maintained well. When worn with matching belts alligator shoes will enhance your overall appearance. Alligator shoes can be quite expensive and are meant for more aristocratic people. If someone owns even just one pair of alligator shoes, it is like owning a life-time treasure. Alligator skins are one of the most highly sought raw materials by the manufacturers of luxury leather items. Since a pair of alligator shoes is a proud possession, you will have to take special care about its maintenance. The shoes have to be stored a in a cool dry areas when not in use. Cleaning alligator shoe is simple but strong chemicals should not be used as it may spoil the finish of the shoes. Alligator shoes have long been evolved as the status symbol and they are much comfortable to wear day long without any discomforts.